Our current and future plans. Interested in an Echo Shiloh? 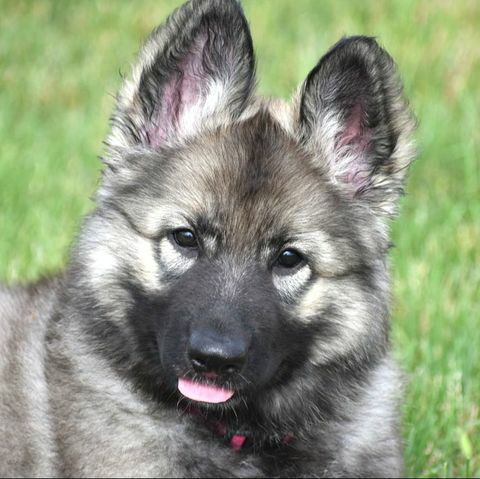 Our Shiloh Shepherd puppies make wonderful family companions. We breed for beauty,health & temperament. All of our pups are temperament tested and evaluated for conformation to the breed standard. The puppies are raised in our home and socialized with our family and friends which include small children, other Shiloh's, friendly dogs and dog friendly cats. This extensive socialization helps our puppies become the well-balanced, loving pup who's ready for his/her forever home with you. Our puppies are also microchipped and come with a written health guarantee. Our puppies go through a modified version of the Puppy Culture program. This has been proven to strenghten hearts, induce confidence and produce well rounded puppies. How is Echo Shiloh's different? I have been a registered vet tech since graduating with my degree in 2005, and since then I have worked in the emergency department. Because of this, I have a thirst for knowledge and have a lot of experience on my side. I have special interest in Reproduction, Health and Behavior as well. I am here through the puppies lives to help their owners and get updates and questions. I become friends with my puppy people and I am always open for phone calls, text messages, emails or Facebook messages as well. I also have access to the best veterinary specialists in the area to help me with questions I don't have the answer for. Also, I am very focused on producing the healthiest dog I can with a sound temperament. In doing this, I need my puppy peoples help. I have puppy owners health test their dogs at the appropriate ages so I can get a full picture of any health issues that may arise. If I only test hips or elbows on my breeding dogs, that doesn't give me a full picture of how their joints are. For example, If I X-ray the hips and elbows on my breeding dog, and they turn out excellent - I would assume that the progeny of that dog would also likely have good hips. What we didn't know, is that 4 of the other littermates failed their hips - which makes it more likely that the dog that has excellent hips may pass on not so good hips. On the flip side, if I test all of the puppies and they have good hips, the better chance that the progeny of the dog bred will produce good hips. 2. Hips and Elbow radiographs sent to OFA or PennHIP at the time of Spay/Neuter, or earlier. I also have Facebook groups set up for each litter so the puppy families can post pictures, questions and keep in touch with everyone from that litter. How is my puppy picked? I get asked many times why clients can't pick their own pups from the litter. Shilohs are not placed as most other breeds. The breeder does not go down the list in application order and let you pick a puppy or just hand out any puppy. We want to place the right puppy with the right people. This saves, say, Grandpa and Grandma, who really want a laid back couch potato dog from getting the most outgoing, energetic pup in the litter as THAT is the pup that is often the first one to run up to new people, not because he 'likes you' but because he thinks he owns the world! If he were to go to Grampa and Gramma, he would possibly turn into the dog from hell because he would be too energetic and would not get what he needs to become the dog that he was meant to be. In a home with, perhaps a runner where the pup gets to burn off some excess energy every day, he would be happy and be a great dog to live with. This process is started with your application and conversations with the breeder. Suppose you want a puppy that cuddles, wants to stay with you all the time, but is an “up” personality for going on long walks and will play ball. You want this dog to also be fearless with strange situations. You only want a male and you want a plush coat. You don’t really care about color but really like the brown/gold sables. These are your requirements and this is the puppy the breeder wants to give you. This is accomplished with the LER (Litter Evaluation Report) which is done at eight weeks. Each puppy goes through a temperament test which tells the evaluator what kind of temperament the pup has (soft, medium soft, medium, medium hard, hard) as well as how he/she will react in various situations. Then each puppy is evaluated for conformation. This details all the positive and negative physical structural characteristics of the pup according to the breed standard. From this examination, the evaluator can determine if the puppy is a pet, breed, or show quality. After the LER, the breeder and evaluator will go over the requirements of each applicant and the qualities of each puppy. If you want a cuddle/clinging dog, only pups that show that quality will be considered. If you want a dog to run with, the very quiet laid back ones are not what you are looking for or need. The only time your “placement order” comes into play is when there are two or more people with the same requirements. The only time you may get to choose between pups is when there are two or more that meet your requirements. However, in your case, let’s say, two pups do meet your needs: one is a gray sable while the other is a brown sable. You will then be offered the brown sable as this was a desired requirement if possible. If your requirements are very specific, you may have to wait through several litters. However, the wait is always worth it because you get the pup you want and do not have to settle for something that is not. Deposits and Prepayments: Please fill out a Puppy Application. To reserve a space on our puppy list, a $400 non-refundable deposit is required. To secure a pick puppy position for a certain litter, a deposit or prepayment must be received. As demand is usually greater than supply and our litters tend to sell out, we recommend you reserve or secure a puppy early, this is especially true of breed and show quality pups as the supply of these pups is not as plentiful in any given litter. Final payment is due by the time the puppies are 6 weeks old. Puppies will be sent to their homes within the following week after the litter evaluation. No personal checks will be accepted within 2 weeks of pick up. Shipping fees: Pups are shipped the week following the litter evaluation, which occurs at 8 weeks of age. Shipping fees are $550. The $550 fee covers an airline approved shipping crate (200 series kennel and shipping materials), microchip, first round of vaccinations and de-wormings, Veterinary health certificate, and transportation to airport and airfare. If the puppy can not fit in the 200 series crate, there may be an additional fee. Puppy "Quality": We wanted to be clear that no matter the “quality” of Shiloh you purchase, they are all still gorgeous and impressive animals and it is important to note that only someone who has studied and trained their eye to see the details of a Shiloh and the Breed Standard will recognize any significant difference. They still stop traffic everywhere they go, and ultimately it is their golden personality that will make them the greatest pet you have ever shared your life with. Matching the puppy’s personality to your own personality and lifestyle is the most important factor in creating a rich and rewarding relationship. Puppy Selection: The final puppy selection occurs at 8 weeks after the LER (Litter Evaluation Report) is completed. At the LER each puppy’s conformation and temperament is judged and assessed. If the puppy is found to have excellent conformation and a sound temperament, they will be categorized as Breed Quality. If the puppy possess minor faults and/or is not required to continue the breeding program, they will be classified as Pet-Upgradeable or possibly Pet Quality. After the LER, Echo Shilohs and the Certified LER Tester will work together to provide recommendations on which puppy would be best suited for each new owner based on their requests and lifestyle. Echo Shilohs cannot guarantee all specific requests will be met, however we will try to meet as many as possible. In the event a suitable puppy is not available in the current litter, we will work with client to find an appropriate solution - this includes moving to another litter, helping to find another breeder who might have an appropriate match, or holding your money paid for up to 5 years until we find the perfect match. Puppy Reservations: All puppy reservations are based strictly on an order-of-payment system, i. e., the first prepayment (full price) or deposit on a breed quality puppy, receives first pick for their chosen litter. The second prepayment or deposit gets second pick, etc. This order is continued through the breed quality pups, and then begins again with the list of pet-up buyers and puppies in the same manner. First prepayment or deposit on a pet-up will receive first choice from that category of puppies. Read and Think: Read our policies and expectations. Think it over. If this is something you would like to move forward on, contact us. Email me: Contact me and we can talk about what litters are upcoming and available and your house. Deposit: When approved, a deposit of $400 will reserve a puppy for you from the next available litter. If there is no puppy available in that litter, your deposit will move to the next litter. The remainder of the purchase price is due at 6 weeks of age. Deposits are always transferable to another litter, but they are non refundable. Make sure to send the wait list agreement with this deposit as well. Prepare: The best way to prepare for a new puppy in your home is to remember or imagine what it is like to have a toddler running around. Baby proof your house. Plan where your puppy will spend his/her time when you are not there. Look into doggie daycare or a dog walker. A puppy can not hold it more than 2-3 hours at a time once you get them home. Plan when and how your puppy will get regular exercise. Get an XL crate that you can section off when they are small. Get an undercoat rake, nail clippers, leashes and a good book on dog training. Decide on which veterinarian and what obedience classes you plan on taking your new puppy to. Puppy Culture: I recommend getting the videos on Puppy Culture and continuing this with your puppies, as I have started it here. Veterinary Visit: Your puppy will visit our veterinarian and receive an examination around 7 weeks. He will also receive routine deworming, and his first round of vaccinations. We will give you these health records when you come to pick him up. LER: We know our puppies best, so we pick puppies for our families. Our decision is based on our observations of temperament, your preferences, and the order deposits were received. The Litter Evaluation is set for when the puppies are 8 weeks of age - then they go home a few days after that. There is a chance a puppy may not match your gender preference, coat type or temperament. In those cases, your deposit is moved to the next litter. Picking Up Your Puppy: At eight to nine weeks old your puppy will be ready for them to join their new family. You will have paperwork to go over with our purchase agreement, and a folder with a lot of information regarding your puppy, their parents and their future. Your puppy will also go home with a goody bag, and a collar. Make sure to bring a leash, a crate for the car and supplies for cleaning up during the trip home. Make sure you plan out where to stop on the way home. Do NOT stop and rest areas, gas stations or where dogs frequently go. I suggest going behind a grocery store or restaurant. Obedience and Socialization: Obedience and socialization are a must with all dogs, but especially with a Shiloh Shepherd. They also have a natural (well-balanced) protective instinct that can be lost without social interaction. As soon as it is healthy for them, expose them to as many positive experiences with people, other dogs and small animals as possible. These dogs need daily outings to expose them to the world. Enroll in an obedience or puppy class. Be prepared for your investment in your relationship with your dog to pay you back exponentially.